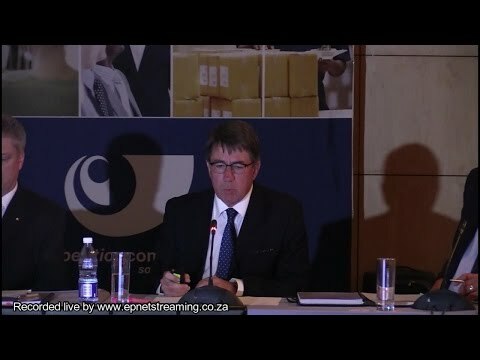 Webcasting Epnet » Watch streaming incredible company profile Mediclinic Live Streaming. If you have a need to present your company to potential customers or partners it is a good idea to have it recorded it either via live web streaming, to a memory stick, or both. There are so many elements that go into a company profile and you may need your CFO to present as well as other key people in your company. The man-hours involved in doing a presentation and if you include your other key company members the loss of company time is great. Do it once and play it over and over again to get your message across to thousands of people. You simply carry it on a memory stick and play it back in meetings or allow prospective clients to view it online. The best way to record a company video is to invite us to attend your next conference or seminar and we will record you in front of an audience. You know that you are at your best in a live setting and obviously have done your homework that is why we record you in a live setting. An example is this video we show on this page for Mediclinic at the Competitions Commission. After you have watched it you have a complete picture of this company’s background, its key people, company potential and any problems perceived in the market place. Does not matter if you are viewing it locally or overseas the web opens up your world to your company and your business. Do you not think that the power of the web makes it possible? Today people are able to watch live or recorded video easily from the web and we are pioneers in business streaming and the latest technology for live streaming in South Africa. Presentations used to be power point slides you carry on a disk now you can just as easily carry a complete company presentation. Imagine you have to present at a high profile meeting but you carry a video in your pocket nothing easier than playing this back through the overhead projector leaving you free to make notes about what further questions your prospects might have after the video is over. Not so many years ago video was very expensive and even today you will find videographers may only work on huge budgets. This has been the norm however web video has found a niche where it is acceptable to film business videos such as at a conference in a live News fashion. Nothing is rehearsed and no expensive props are used it is simply recording a live business gathering. This has proved more than acceptable on the web and is called “social video”. If you are doing a company presentation simply have us record it and your business will be greatly enhanced in all future meetings or conferences that you attend by the way you can even give it to an attendee to a conference and ask them to play it back you don’t even need to be present! Reduces time needed to complete tasks: 82% agree that it reduces the chance of miscommunication in their business It is clear that video conferencing brings a number of benefits to organizations, especially as demand for flexible working increases. To keep productivity high, build business relationships and increase efficiency, they need to fully embrace the technology. It’s all so incredibly easy to communicate than ever before, sell your company, products and services using live and recorded web streaming. Find out how video is changing the way business communicates. Leverage video to connect and drive customer engagement. You can also stream and record company updates, business presentations, sales meetings, training sessions, announcements, new employee welcome greetings—even fun activities like company socials, community volunteer events and holiday wishes for your remote workers and sales force to view at their leisure. Local Government can even use it for Municipal meetings to ensure people that officials are working on and providing services and that they understand how local government actually works. Additional areas of video conferencing application, apart from business are the medical sector, legal sector, and education, especially broadcasting training. Plus, you can embed live and recorded videos on public websites, intranets and social media.